The mountain was named Crain’s Mountain in 1772 in honor of the surveyor Moses Crain, although according to lore its aboriginal name was Moos-pot-ten-wa-cho, or “thunder’s nest.” For well over a century it was presumed to be the highest peak in Warren County, until Verplanck Colvin determined that Gore Mountain was several hundred feet higher in 1877. In 1911 the Conservation Commission – an early forerunner to today’s Department of Environmental Conservation – placed an observation station on the summit of Crane, with a telephone line that connected it to the central office in North Creek. Rather than a tower, the station consisted of two camps: one at the pond where the observer stayed at night, and one on the summit. The materials for these camps, as well as the insulated copper wire used for the four-mile-long telephone line, were carried up the mountain on the backs of men. A few years later, in 1919, a 35-foot steel tower was erected on the summit. 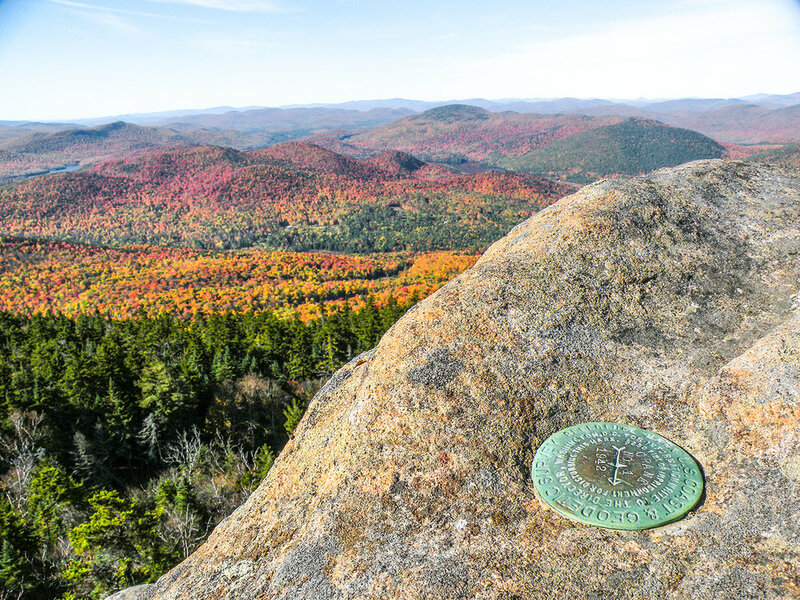 The fire tower is gone, but Crane Mountain is easily one of the most enjoyable peaks in the entire Adirondack Park. Its trails scale some of the steepest slopes on the mountain, which rise imposingly above you as you drive toward them but this steepness has always been a part of the Crane experience. The terrain is rugged, but the miles are short, and so all of the best features remain within reach for many people. The state trailhead for Crane is located at the end of Ski Hi Road near the south end of the mountain. Follow NY Route 8 to Johnsburg, and then turn south onto South Johnsburg Road. At the tiny hamlet of Thurman, turn right onto Garnet Lake Road. Ski Hi Road (pronounced “Sky High”) turns right at 1.3 miles and climbs 760 feet to an elevation of 2080 feet above sea level. The parking area is located at the very end of the road. The most direct route to the summit of Crane Mountain from the Ski Hi Road trailhead is almost all uphill. Called the Ranger’s Trail during the days when the fire tower was manned, it is a steep route that requires the use of two ladders on its upper slopes. Level interludes are few, but they are welcome when they occur. When seen from afar, it seems impossible that there could be a hiking trail on such a precipitous, rock-scarred slope. Nevertheless, the Ranger’s Trail uncannily finds a feasible route to the summit through a wooded corridor, and it is hiked by many people every year. From the DEC parking area at the end of Ski Hi Road, the foot trail leads almost due north to the foot of the mountain – and within moments you are starting to climb. White pines and red oaks distinguish the lower woods, and occasionally there are window-like views across the valley by which you can gauge your progress. The trail is very rocky, a fact that frustrates snowshoers when the snow cover is lean. Despite the cliff-like appearance of the slopes from afar, the trail stays in the woods for most of the ascent; the first patch of open rock that you encounter is followed a moment later by a trail junction in the coniferous woods at 0.5-mile, 780 vertical feet above the trailhead. The trail to the left is the Crossover Trail to Crane Mountain Pond. Bearing right, northeast, the trail leads through balsamic woods to a steep ledge that you must scramble up or around, and then to a small ladder that is only a little more than 500 feet beyond the junction. The ladder leans against an angled ledge, above which the trail pauses in the ferocity of its ascent as it heads a little south of east below the main summit; you have brief views of the imposing cliffs to your left. You turn more northerly again and reach the foot of a second ladder at 0.9-mile. This one is about 25 feet tall and leans against a craggy rock wall; from its top you must take a step to the left to return to solid ground. In winter, when snow obscures the footholds, this can seem like a leap of faith. There are few good handholds. This is no place for young children, dogs, or anyone with vertigo. However, once you safely exit the ladder you are less than 300 feet from the summit. Nearly all of the remaining distance involves rock ledges, until finally you step onto the bald spot where the fire tower stood, one mile from the trailhead and 1,170 vertical feet above it. The view is phenomenal! 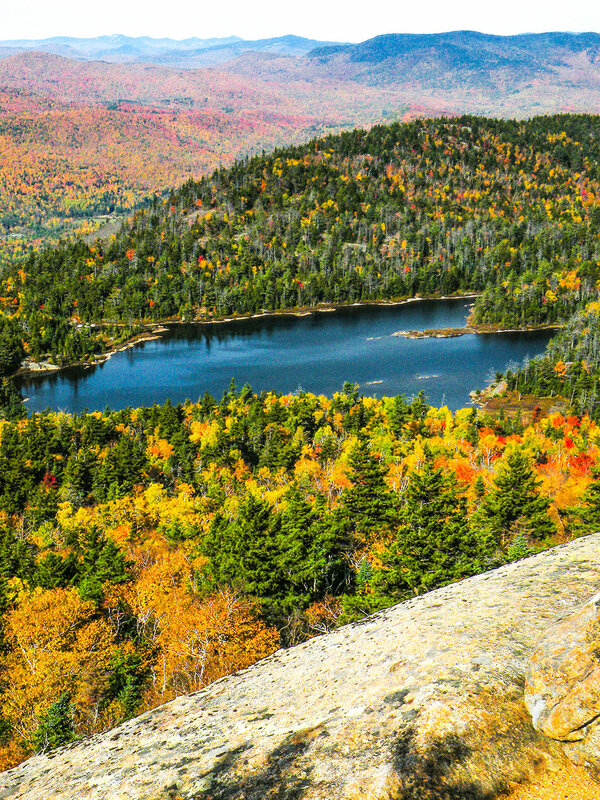 The centerpiece is Garnet Lake at the foot of Mount Blue (with tiny Lizard Pond lurking just beyond), but your field of vision ranges from a distant Hadley Mountain to the south, to Kettle Mountain to the west, with too many other mountains in between to count – they extend all the way to Hamilton County. Trees block views to the north and east. The footprint of the fire tower, which was removed in 1987, is clearly visible on the summit rock, and a well-used path leads down behind the knob about 75 feet to the site of the observer’s cabin, located in a small clearing. A herd path leads eastward from this spot to an off-trail ledge that extends the main view more to the southeast. Bill Ingersoll of Barneveld is publisher of the Discover the Adirondacks guidebook series (hiketheadirondacks.com). For more information on this region, consult Discover the Southern Adirondacks.